The CRM road is littered with deployments that are functional failures and that don’t meet value expectations. We see it all the time. In fact, a good part of our business is fixing deployments that have been designed, installed, and rolled out by others or internal IT teams. 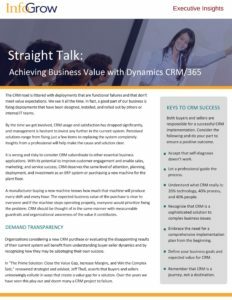 Organizations considering a new CRM purchase or evaluating the disappointing results of their current system will benefit from our whitepaper Straight Talk: Achieving Business Value with Dynamics 365/CRM, for understanding the buyer-seller dynamics that may be sabotaging their own success. It must be noted that both buyers and sellers are responsible for a successful CRM implementation. Each must do their part to ensure a positive outcome. A buyer should expect that a knowledgeable partner will provide the buyer guidance necessary to be successful. Accept that self-diagnosis doesn’t work – Have you ever heard the saying “An attorney defending him/her-self has a fool for a client”. 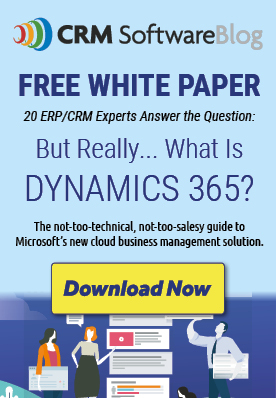 The real issue is how many times has your in-house person analyzed and designed a CRM system? Do you want to risk the expected value from a system design on someone who was involved in a system roll-out, once, at their last employer? Or someone who has experience with dozens or even hundreds of CRM system designs? The analysis and design process is truly a case of “what you don’t know” will hurt your ROI. Understand what CRM really is: 20% technology, 40% process, and 40% people – A CRM deployed only as a technology project will not last the first year. Your focus must be on aligning processes and recognizing that culture change for the people involved are the guidepost. We find that for many organizations even knowing what their sales process is can be challenging. Define your business goals and the expected business value for CRM – A manufacturer buying a new machine knows how much that machine will produce every shift and every hour. The expected business value of the purchase is clear to everyone and if the machine stops operating properly, everyone would prioritize fixing the problem. CRM should be thought of in the same manner, with measurable guardrails and organizational awareness of the value it contributes. Throughout this effort it is important to remember that CRM is a journey, not a destination. You should expect changes in the system, your processes and your people. Plan for those changes by providing support and on-going training. InfoGrow has over 27 years of experience helping companies accelerate their sales and marketing effectiveness through better decision making. We help our clients identify their best prospects, discover missed opportunities, focus on their most profitable accounts, and reduce marketing waste. Count on InfoGrow to support your efforts to find more customers and keep the ones you want. How Do You Get Your Sales People to Use CRM Software?